For two years the Hermann community would enjoy the success of both teams as they became known for more than their German Maifest celebration. The success that both of these teams were experiencing was a direct result of the two outstanding coaches that were leading these teams. Don Gosen, the coach at Hermann High, and Dennis Kruse, the coach at St. George High, were both back at their alma mater, guiding their school’s team they once played on. Both of these coaches would serve their country in the military, one of them doing so during the 1950s while the other would be drafted and almost sent to boot camp in the middle of this magical season. This is the story of the middle school coaches who laid the ground work with these young men, the competitive games in the summer time on the playground at the elementary school, and the game by game account of the 1968-69 season that most people felt were the two best teams that these schools put on the court. This story will live on, hopefully forever, in the hearts and minds of those who lived it and for today's players of the game that will realize the uniqueness of what these two teams achieved. It was a special time; it was a magical time; it was a time that will live forever in the minds of those involved. 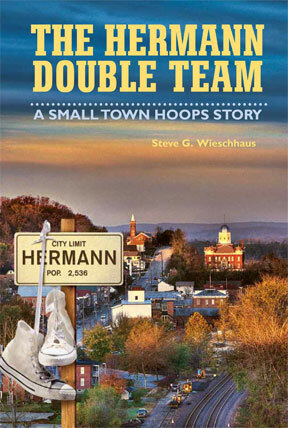 For the Hermann Double Team was a small town hoops story that is as unique as it is memorable. Details of it's release have not been announced.